San Pedro Town has a new Deputy Mayor in the person of Gabriel “Gaby” Nuñez. The announcement was made by The San Pedro Town Council on March 7th via a press release in which it indicates that Nuñez took over the responsibility from councilor for the year 2014-2015. The new appointment of Nuñez also saw assignments of responsibility being reshuffled within the council. “The new appointment does not really affect any of our portfolios since the Deputy Mayor’s position is rotated every year. For me I am appreciative of the responsibility entrusted to me by my other colleagues and I will continue to work with them as I have been doing since I was elected to office. I will continue to support them, be by their side and work hand in hand with all my councilors as I have been doing in the past,” commented the new Deputy Mayor. As a result of the portfolios’ reshuffling, Mayor Daniel Guerrero also takes on more responsibilities which now include Finance, Revenue Collection, Economic Development, Customer Services, Foreign Relations, Communications, Consultation Services, Education and Culture. Councilor Mito Paz is responsible for Tourism, Environment, Town Zoning and Planning and Non-Government Organizations (NGOs). Councilor Severo Guerrero Jr.’s responsibility has been reduced to Civic and Infrastructural Development and Health. Councilor Carlos Barrientos keeps his portfolio of Community Beautification and Upkeep, Public Events, Human Development and Women’s Affairs. Councilor Kenrick “Kenny” Brackett also retains his responsibilities which include Public Relations, Transport, National Emergency Management, Waste Management and Sanitation. The only opposition councilor Gualberto “Wally” Nuñez is in charge of Community Protection and Safety, Neighborhood Watch and Drug Awareness. 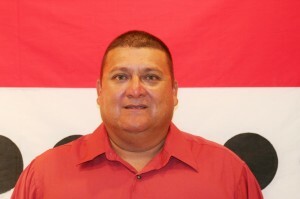 The San Pedro Sun congratulates Gaby Nuñez on his new post as Deputy Mayor. We wish him all the best.